In the U.S., there are 28.8 million small businesses, accounting for 54 percent of all sales reports the Small Business Administration. Across the country, public libraries are supporting entrepreneurship as a core mission, and are increasingly serving as vital members of their economic development ecosystem. 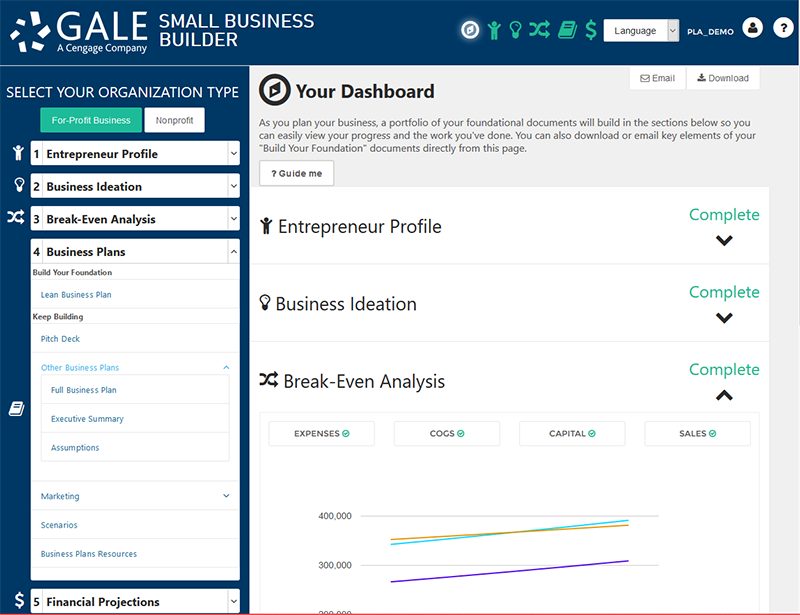 For entrepreneurs and small business owners, the complex and often stop-and-start process of business planning just became more efficient with the newly enhanced Gale Small Business Builder. The popular trio of DemographicsNow, Small Business Resource Center, and Gale LegalForms is now integrated into this resource for libraries subscribing to any of the products, putting content into the customer’s business planning workflow. As users move through the five areas of Gale Small Business Builder—Entrepreneur Profile, Business Ideation, Break-Even Analysis, Business Plans, and Financial Projections—they will encounter up to 400 highly-curated links to “Helpful Resources” that will inform and assist them in completing business planning activities. For example, in the “Customer Segment” panel on the “Lean Canvas” page, users can select a link under the “Helpful Resources” menu titled “Learn About Your Potential Customers” and run a demographics or consumer-spending report in DemographicsNow. For ease of use, there is also a link to a DemographicsNow tutorial video for that specific task. Small Business Resource Center A comprehensive database covering all aspects of starting and operating a business, including accounting, finance, human resources, marketing, taxes. Includes over 1000 business plans, and more. DemographicsNow: Business & People Connects users with tools and a wealth of highly detailed demographic data that spans the entire United States, making it ideal for gaining consumer and market insights for opening or growing a business. 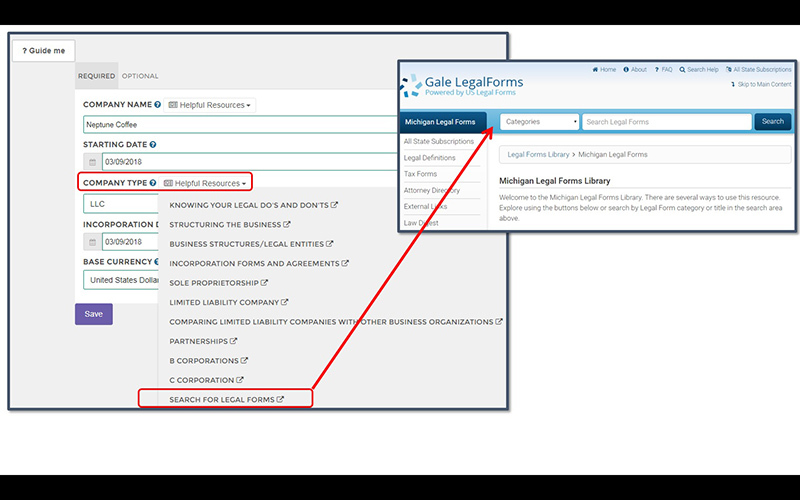 Gale LegalForms Provides access to thousands of authentic, state-specific legal forms relevant to starting or managing a new business while offering the most robust collection of legal information available. Libraries that do not currently subscribe to Small Business Resource Center, DemographicsNow, or Gale LegalForms will continue to be able to access a limited number of static articles from Small Business Resource Center in the "Resources" section of each planning stage. Business-friendly Naperville Public Library is a winning example of libraries driving economic growth in their communities. Using Gale Small Business Builder as a core resource in their NaperLaunch Academy, which helps entrepreneurs develop fundamental business knowledge, the library has successfully served 53 business owners over the last year. Business Reference Librarian, Joe Collier from Mount Prospect Public Library located just outside of Chicago, tells why Gale Small Business Builder is the perfect tool to help patrons write a business plan, whether they’re a novice or an established business owner. With this integration enhancement, Gale Small Business Builder provides meaningful and timely access to articles, tools, and forms at a patron’s point of need, saving them time and cognitive load, and reducing in-person library staff intervention. Intuitive Dashboard –simple but comprehensive user dashboard guides entrepreneurs through five essential steps to "Build Your Foundation" and "Keep Building." Planning Tools—the Lean Canvas, an internationally-recognized planning tool, breaks down a company into nine building blocks to help users define the problem their business is solving, its unique value proposition, targeted customer segments, and more. 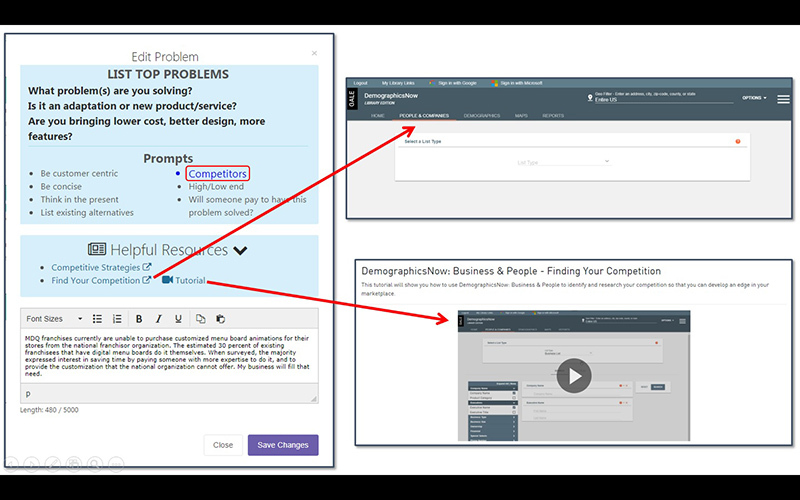 Lean Canvas “prompt” links out to DemographicsNow and tutorial for “Find Your Competition” task. 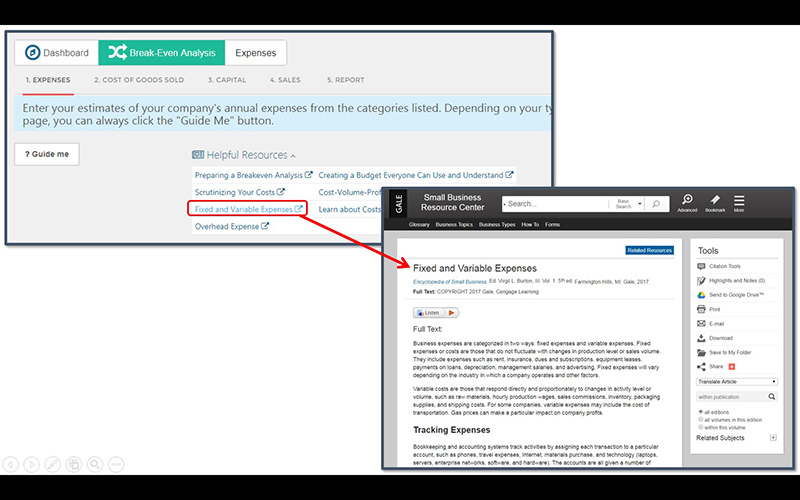 Break-Even Analysis “Expenses” page links to Small Business Resource Center article describing the difference between fixed and variable expenses Lean Business Plan’s “Company Type” resources include a link to state-specific Gale LegalForms.